Beautiful Buffet – Before and Amazing After! Are you ready for one of our favorite makeovers ever?? I found this buffet at a second hand store in October a few short months ago! 🙂 I had a hard time deciding exactly what I wanted to do with it. The woodwork and the detail on this piece is so amazing, so it had to be perfect! I FINALLY figured it out! I wanted white AND the details accented in grey! It turned out to be a match made in Heaven!! Check out that detail! A-MA-ZING! Perfect place for extra storage! 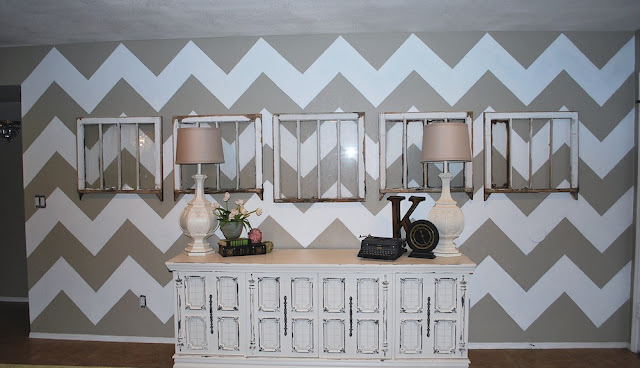 See the chevron wall tutorial here. The greatest thing is, I bought this piece and did a complete makeover for less than $50!! I know, right?! Mallory says this is her favorite makeover that I’ve done! What do you think? Is it your favorite? What do you think about the grey and white!? PS. Check out our “Party Time” tab to see where we’ve linked this baby up! Oh my goodness… this is absolutely GORGEOUS!!!!! I love it, so much. I love the grey accents, it just pulls it all together. Nice job! This is so pretty. What a great size too. I think we overpaid for the china hutch my husband brought home. But I’m excited to paint it out, add some hardware and personal touches. HI! Found your link through MMS…..this piece looks amazing! I love the gray accents to the white…it makes everything POP! GReat job! I LOVE it! You can never go wrong with white. What an awesome makeover and for such a great deal!!! Fabulous Job!! WHOA!!! That is some well paid off hard work…it’s simply gorgeous! Absolutely!!! I adore your buffet. LOVE this!! Gorgeous! What did you use for the grey, I love it! I absolutely LOVE this!! You did a great job!!! I am your newest follower! I am a brand new blogger…I hope you will drop by my blog sometime!! love everything about this!!!!! great job! Fabulous! I love what you did with the dresser. It looks 110% better! Very nice makeover. This really was an amazing buffet to work with and you brought it to life! It has such beautiful presence now! Love how you accented the detail with the grey. That piece is a monster! It is just gorgeous, too! I think it’s amazing! You did such a great job! I love the colors and I love how it turned out! Love, love, love it! It looks great! You know, I’m not a gray person at all but this piece with just a touch is stunning! Great job. another gorgeous piece! the colors on this one oare beautiful- i love gray! Visiting from A2D…..wow, that is just gorgeous and you did an amazing job on it! Gorgeous!! I love the distressing on the paint finish, and those pulls are amazing!! Yes it is amazing. I LOVE IT! Oh wow! That before and after is amazing. This looks great. I love distressing it with grey. VERRRRRRY pretty! I love it! Is that hardware original? It’s very cool. Очень изысканно! Нравится этот стиль. В данном случае и форма замечательная, и в оформлении ничего лишнего. Very unique buffet. Like the drawers. I seen one new on web site and then at stein mart but had mirrors cut into the door squares. You did a great job. What a transformation. This looks wonderful! Great job! I love the color combinations! I’m LOVING the gray and white. I’m going to have to try that! I’m a new blogger and now a new follower! Oh my, what an amazing piece. You did a beautiful job! love this! bought a similar dresser and want to paint it…haven’t done it yet. how did you do this? thanks! This is beautiful! Love the grey and white together! Um seriously Savannah? I am obsessed with this makeover! so pretty- i love all the details! and it looks PERFECT on that wall. Wow! This looks great! You need to do a tutorial on making over and distressing furniture! Amazing piece! Hi ladies, we just love your work. Beautiful. This makeover with the white and grey is gorgeous. This is beautiful!! I love the charm and texture! WOW this is absolutely gorgeous! I’m curious, did you use grey paint to give it the “distressed” look or did you sand it…or another technique?? I’m just finished my first refinishing project and am excited about my upcoming ideas!